Forrest and Barbara invited FHREEC to help install an addition to their ground mount system. Winter SunRaisers are always a challenge as it’s difficult to announce clear moments in Kansas weather. In spite of the two day advance notice, we had nine people there to help: attended by Jacque Gibbons, Ben Jedlicka, Betsey Edwards, Lee Skabelund, Ellen Hargrave and her father, John, Nathan Dorsett, Bill Dorsett. We were in time for some very good chili and tortillas for lunch. Forest completed the wiring back to a junction box serving the rest of his array. A few weeks before, Kenny Foust & Bill Dorsett met with Doug Toll to finish their 27 panel array. While it looked dreary, it turned into a wonderful day to be outside. And like before Cigi provided a great meal. The Holcomb coal will probably be re-proposed, and additional hundreds of millions will be wasted on “Clean Coal”*but I suspect there will be no new coal or nuclear power stations in Kansas. You just don’t plan massive new investments inside the four year election cycle and expect the political winds to allow you to forever spew greenhouse gasses. Most of us anticipated a favorable climate for renewable energy to continue on for at least another four years. And globally solar prices are continuing to drop, so internationally the outlook for solar energy is still quite bright. But for the US, opposed to the price drops for solar hardware, is the risk of losing the 30% tax credits. Given the trends with the new administration, I think all bets are off for tax credits, etc. I think when the new administration comes on board, things could move very fast with the new Republican President, Senate and House. They have commitments to coal, petroleum and utilities. Those of us who have been in the industry long enough watched in dismay as President Reagan took the solar water panels off the White House. There would be a time lag between the current tax credits and their dropping. There would be a rush for the hardware, and a plateau or rise in price. Attached is our newest 17 panel System Price sheet. Order first come first served. Larry Erickson, one of our new board members and coauthor of the “Solar Electric Charge Station Infrastructure”, has agreed to chair a committee on solar powered charge stations for electric vehicles. Anyone with a particular interest in electric vehicles is welcome to join this group. 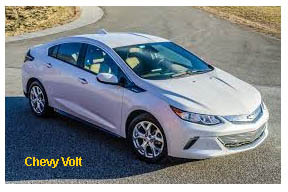 Surprisingly, used electric vehicles are selling for very affordable prices: a 2013 Chevy Volt original selling price was ~$40K is now selling in Kansas for about $16K and Nisson Leaf’s are even less…~$8K. At least one of our members has installed enough excess solar to power an electric car and it is becoming apparent that we’re overlooking one of our most promising opportunities. Fourteen 260W panels would give the average daily charge for a carbon free 38 mile commute in a Volt…for 25 years. An electric motor has only two parts, and no high temperatures so the miles should wear very differently than for internal combustion engines. My gasoline Honda Civic has carried people for 23 years. There is no reason to think an EV (electric vehicle), a PHEV (plug-in hybrid electric vehicle) wouldn’t complete at least 25 years to match the warranty on your solar array. As of 2016, charging stations in Kansas are rare enough that it makes sense to drive as much of your daily travel on solar electricity and have a very small gas engine to complete any extra miles needed. So it may make sense to plan for a PHEV until publicly accessible charge stations are common. Ruth Douglas Miller referred us to Dan Whistler who teaches high school in Sterling, KS. Westar helped the high school buy a Volt and he has very good numbers for the amount of gasoline displaced by the high school’s PV array. For the years 2012 and 2013, he has reduced gasoline consumption by 606 gallons and reduced his CO2 emissions by 11,827 lbs (though some of his electricity is from coal). For most of your trips you can drive past all the cars waiting at gas stations. A similar group buy might work even easier for other electric transportation. A single ebike could have no impact on the grid: if one was to use their ebike for about 1,000 miles each year, they could expect to use somewhere around 20,000 – 25,000 watt hours, which is the equivalent of running a medium sized window AC unit (900w model) for about 22 – 28 hours. This is a pretty general statement but it gives a rough sense of the scale. Solar energy is naturally democratic. Like rain, it falls on your house and mine. And unlike coal or natural gas pipelines, it’s hard for monopolies to corner the market. You own the wiring in your house and its roof. Homeowners can do their own electrical work, so for about the cost of a used car, you can generate much of your own power. It’s easier than you think. We will be discussing advances in solar technology from independent systems to grid tie with battery backup. A home that has it all: SIPS construction with passive sunroom, Solar batch water heater and a tracking PV system. We will meet at UFM and car pool. Thanks Everyone. We have a lot of work to do. The news from Washington continues to be unsettling for clean energy and the environment; Trump's EPA pick, Scott Pruitt, has been a longtime opponent of federal environmental regulations and a vocal climate sceptic. Secretary of State nominee, Rex Tillerson, is a former ExxonMobile CEO and Secretary of Energy nominee, Rick Perry, once said he wanted to abolish the Department of Energy. While the 2017 Kansas Legislature will have its hands full dealing with the budget deficit, school finance and Medicaid expansion CEP remains optimistic about clean energy. While much of the country shifted right, the Kansas House will have 40 Democrats (up from 28) and several new moderate Republicans, thus a working majority on the floor. The Kansas Senate is more balanced with approximately 20 conservatives and 20 moderate Republicans and Democrats. Last week we were thrilled to host a series of Energy 101 events for new and returning legislators, sharing with them information about the electricity landscape, how Kansas generates our electricity and opportunities for capitalizing on our rich renewable resources. We were excited to learn of a new Freshman Caucus and to hear the enthusiasm for advanced energy from new and returning legislators. While there is much to be concerned about our legislators appear willing to find common ground and work together for the good of our state.